The heart shape is a ideogram used to represent the center of emotion; including love, affection and romantic love. The heart shaped patterns can be used for not only during Valentine's Day but throughout the year. 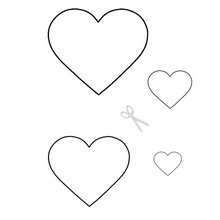 The heart shaped printable patterns are great to decorate your school books, making ornaments, party name tags, tracing to paint a picture, crafts and cards. 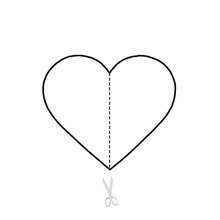 Hearts are the most popular symbol of Valentine's Day and a fun way to make a Valentine's Day card or craft special for that sweet someone. Click on the icon below, print and use to color or trace. Give a heart of love or friendship this Valentine's Day. Other sweet ideas for the Valentine's holiday will keep your heart warm and a smile on your face. Learn a Valentine poem or joke, create a fun Valentine's Day craft, play Valentine's Day games or have your friends over to color lovely Valentine's Day coloring pages. There is so much fun to discover on the Hellokids Valentine's Day channel.